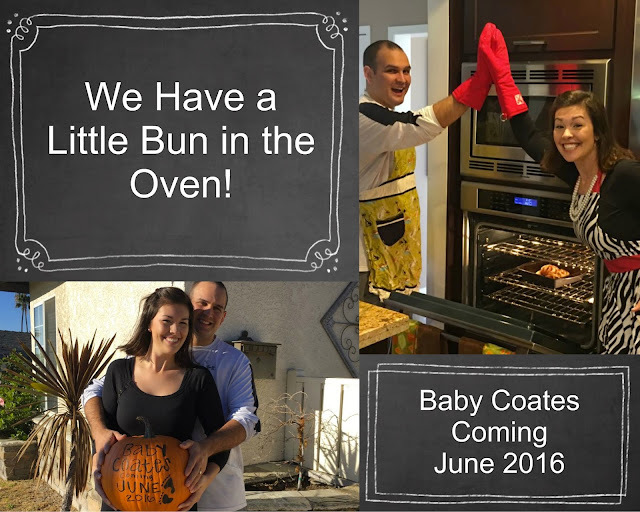 Texan Girl Talks: Hello Baby Coates! Baby Coates will be making his/her debut June 2016. So I will tell you right now, Yes, we had been contemplating having the chirrens (children, I'm still from Texas, remember?) for the a good bit of this year. FREAKING EXCITED ABOUT IT MIGHT I ADD!! So I have two trusty pregnancy tests. What the hell, I thought they would probably be negative. They were most certainly not. Y'all, when I saw those two lines. I felt a rush of feelings. I was scared, excited, happy, thinking is this even real?, then I thought how amazing and blessed I am. I absolutely never felt like this in my life. I get to show this little person, EVERYTHING! I get to hold hands across the street. I get help with homework. I get to help someone be the best they can be. I get to make my husband a dad. Something I always knew he'd be good at. He's one of those people that is so warm, nurturing and loving. He's one of the best people in the world, I know that he will be the best dad ever. After nearly 10 years together, this is the best gift we could have given to one another. Here's to one amazing year ahead of us! Baby Coates the First: We love you more than you'll ever know! So excited for you! You'll be a great mom!